Last week, I wrote about Broken Links. I described how we all have systems and things that stop working, we no longer use them, but we never actually take the final steps to dismantle or dispose of them. 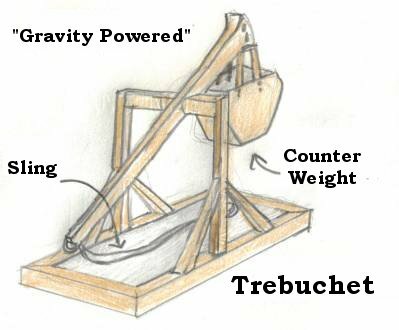 I now have another example: A physics project made by my son; a trebuchet (see example below), which is now sitting on my front step, where it was removed from the van, after the presentation at school. It will take some work to dismantle, and I get that.... I just hope it happens before the graduation party!! This is a container (mine is an open cardboard box) that lives in a convenient location, hidden from plain view, and hopefully up out of the reach of peering eyes. Into this box I put things that have been lying around, that no one has claimed, or that seem to be no longer the priority. Tiny little toys and stickers, paper airplanes, things I am not sure I am done with, but no longer want to look at, older but still beautiful art projects, etc. All of these go into the ripening box. If by chance someone says to me "Did you see my xxxx?" I can easily dig in there and find it. If not, when the box is full, I empty it. Some things I may return to the owner, or save in the box for the next cycle, but most I either discard or donate. The box isn't very big, and I empty it every three months or so. Right now, a toaster is in my box, waiting to see if there is a need for it in my son's college dorm room. Lest you think I am a callous person, let me tell you that I can probably count on one hand the number of times that I have had to dig into the ripening box. What I have found is that we have a plethora of stuff at any given time and much of it is not needed or missed. What do you have laying around that you could put in The Ripening Box? Share in the comments. I would love to hear. We get lots of those things that usually end up on a pile or in the junk drawer. I like your idea! I'm actually using that idea to a certain degree right now. We recently moved and I haven't unpacked most of the boxes yet, except for clothes. I am waiting to see if we need most of this "stuff". If we haven't taken it out of its box for at least 6 months(or maybe through a couple weather seasons, Christmas, etc. ), clearly we don't need it. It can be given away. So far (we have been here almost 7 weeks) most of our stuff is still in the boxes!